KORAT, THAILAND—Mahajak Development Co., Ltd. recently installed a complete HARMAN audio solution at Terminal 21 Korat, the largest shopping mall in the city of Nahkon Ratchasima. 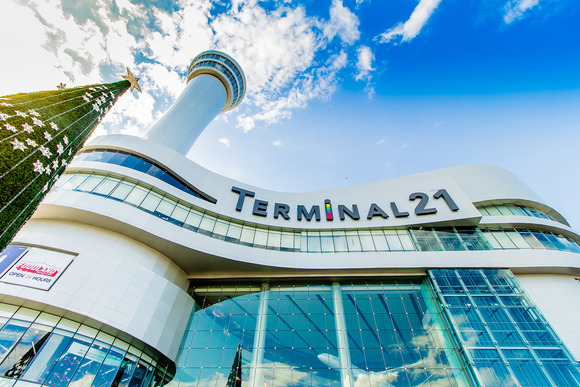 Terminal 21 Korat features 200 outlet stores, a movie theater, an ice skating rink, an amusement park and more. Each of the building’s seven floors are decorated to make customers feel as if they’re visiting popular cities like Paris, London, Tokyo and San Francisco. In order to provide audio coverage for a wide range of entertainment environments and specialized areas, Terminal 21 Korat hired Mahajak Development to install a complete HARMAN audio solution consisting of JBL Professional speakers, Crown amplifiers and BSS signal processors. The system Mahajak Development installed at Terminal 21 Korat features a variety of JBL solutions, including JBL CBT 70J-1, JBL Control 1 Pro, JBL Control29AV-1 and JBL AC18/95 loudspeakers. The entire system is powered by Crown XTi 4002 and Crown XTi 2002 power amplifiers. Signal processing is handled via BSS Soundweb London BLU-100 and BLU-50 signal processors, and BSS BLU-3 control panels provide easy volume control and source selection for each zone.